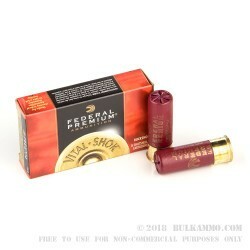 Federal’s Vital-shok ammunition line is the go-to load for hunters of large game such as deer. Hunting deer with a shotgun requires a tight spread and a lot of knockdown power, which this 12 gauge Vital-shok load brings in spades. 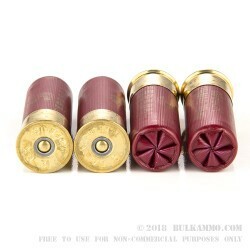 Each shell in this box of 5 uses a dozen lead pellets plated with copper to help them resist deformation and strike the target in a consistent pattern. 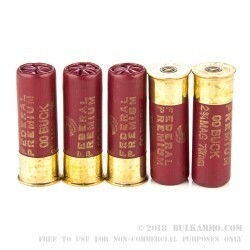 Combine that with Federal’s buffers, shot cup, a proprietary spiral stacking system, and a propellant load that achieves 1290 feet per second out of the muzzle and you have a powerful shotshell for hunting and personal defense. 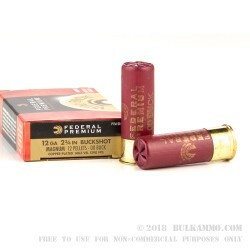 Federal Premium Ammunition manufactures the Fusion, Vital-shok, and Power-shok hunting ammunition series as well as the renowned Hydra-shok and HTP self defense loads. The company’s products enjoy a reputation for above-average quality at a moderate price point. Federal’s primary production facility in Anoka, Minnesota, where the company was founded in 1922, covers over half a million square feet and produces millions of cartridges every month. As a subsidiary of defense contractor Alliant Techsystems, the company also manages Lake City Army Ammunition Plant, the US military’s primary munitions factory.